This winter has been a mild one. In Paris, that is. While I can't say I'm jealous of the American snow this winter, I do wish we could have at least one flurry here. The past two winters have been unusual in that Paris has seen several snow falls -- some of which really stuck. I'm glad we appreciated them while they were here. As the thermometer dips below zero -- minus10°C, so about 14°F -- it feels really cold to us. We are all wearing ski mittens and long underwear, along with about five layers on top. And we still need to get out of the cold and pop in for a hot chocolate. Even though I grew up in very cold places (Rochester, NY and Minneapolis, MN), fourteen years in California and two years in the tropics before that (Hawaii and the Philippines) have made my blood all sluggish and lazy. Much like Paris traffic at rush hour, it simply does not want to circulate. What else could we possibly do but go see the Eiffel Tower in full winter glory? And from many angles. No way would I miss photos of Notre Dame (flying buttress alert!) dusted in white.﻿ As you can imagine, I photograph snowy Notre Dame from every angle, too. For the biggest storms, the excitement starts with the first flurries at night, with the snow starting to fall. Will it stick? Yup, we wake up in the morning, and the view out our window onto the bridge is still all white! 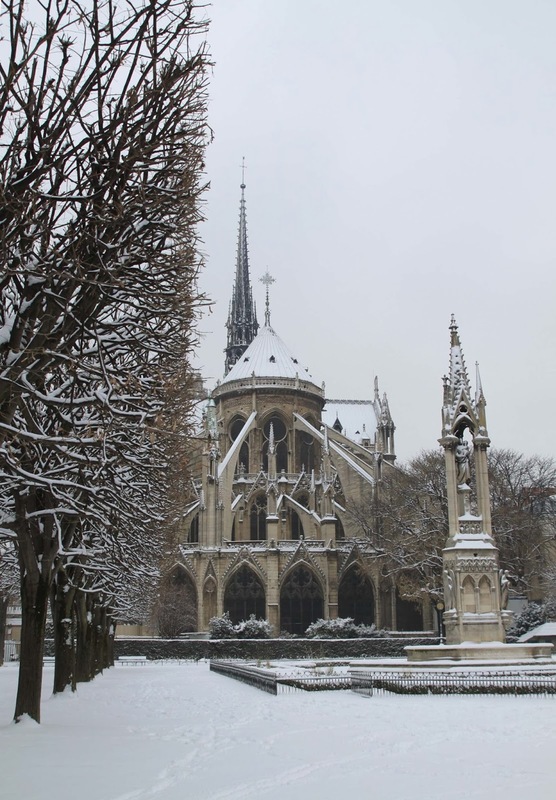 According to Parisians, even a one-day snow in Paris is rare. But this turns out to be much more than just a one-day snow. It's a thick blanket that lasts for days, covering buildings, sidewalks, streets, parks, cars, and café tables. It is so substantial that my life-long Parisian friends say they've only seen a snow like this in the city once or twice in their lives. Don't believe it? Watch these guys (illegally) skiing downhill from Sacré Coeur! The photographers come out in droves. And it's not just the tourists. Locals who never take pictures break out their smartphones and start snapping away. Locals who take the occasional photo with their smartphones purposely bring their point-and-shoot cameras along. Locals and tourists who are normally inclined to walk around with a point-and-shoot bring out their good cameras. And people like me who usually walk out with their good cameras bring out their best cameras, their best lenses, tripods, and make special trips around town just for the photo ops. While it's harder than usual to take cabs, cars, buses, or even metros (occasional above-ground tracks are frozen and snowed over), walking around Paris is even more blissful than usual. The city is nearly silent under its snow blanket, and none of the Parisian drivers know how to drive in the stuff. Suddenly, I can cross large, confusing, seven-point intersections straight across the middle without even worrying about the traffic lights. When I do see a car in the distance, the driver is going as slowly as the accelerator peddle will allow, fearful of slip sliding away. The girls and I build this traditional snowman, with a finger-knitted scarf, carrot nose, and avocado-pit eyes (well, almost traditional) in the garden behind Notre Dame. I have to come clean and admit that he looks much bigger than he really is, because I get right down on the ground for the photo. Then, we run into one of Gigi's good school friends and her family and end up having a raging snow ball fight. It's perfect snow to pack and completely, shockingly unexpected. 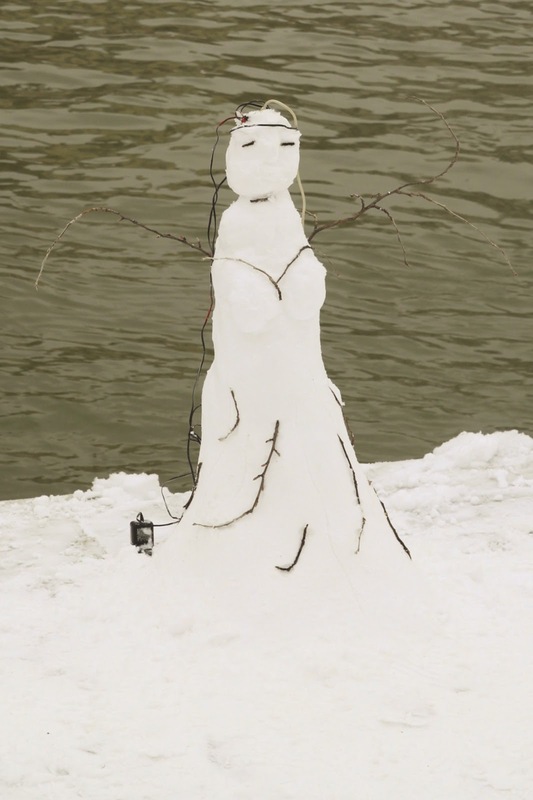 We take a tour on the quai, where the kids slide down the banks (but, it goes without saying, not actually into the Seine), and where we discover that we are not the only ones to build a bonhomme de neige, or snowman, or snowghost or snow-river-goddess, as the case may be. Sadly, there's no snow at present, but it would be quite a present if we could get just some of the snow that the US doesn't want. As we are in France, there is only one acceptable way to follow up a day in the snow, and that is, of course, with chocolat chaud (hot chocolate). 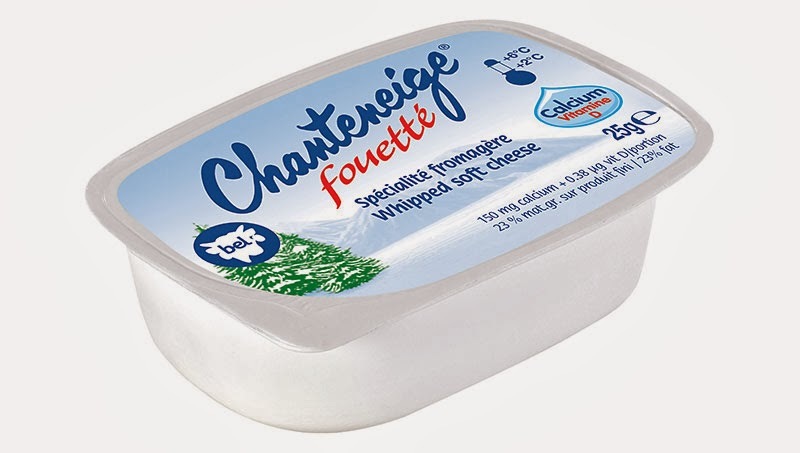 Chanteneige is an industrial, processed cow's milk cheese from Bel, the makers of nearly every other major-name, industrial, processed French cheese. Here they've invented a small plastic tub of whipped soft cheese that is mousse-ier than a whipped Philadelphia cream cheese, and also wetter and less salty. The name is a combination of the words "chante" ("sing") and "neige" ("snow"). It's the kind of cheese that a school might serve at lunch to the kids or as a snack on a field trip, which is where I taste mine. The kids like it, and I can't say it's awful, but it's not anything special either. I must admit that my first choice for this post is a cheese called Buche des Neiges which I can find on the internet, but not in real life. I will keep hunting it down, and I may find it in time to use it for an ironically-connected posting which does not involve snow. So for today, Chanteneige will have to do. At least, it's snow white and fluffy. And more than that, no other cheese sings "snow" to me so much as a cheese whose name means "sing-snow".